THE Annapurna Circuit trek, estimated to run as long as 230 km — which is, if you ignore the elevation, like walking from Manila to Baguio — averaging at 20 days from start to finish, an epic journey even for most trekkers. This was one journey I refused to delay, scribbled down on a piece of metaphoric paper, placed pointlessly in a dusty old box labeled: Bucket List. I had recently, though temporarily, been frustrated with the confinements of society and required the silence only the vast expanse the wilderness could offer. Nepal was the obvious choice, and if you have to ask why, simply consult Google. Situated at the heart of the Himalayan Range with some of the best treks the world has to offer, some travellers spend months attempting as many as physically possible here, addicted to the landscape. Addiction to the landscape is one I share, a desire to witness the uncanny magnificence of nature, and walk through the unknown alone to fully connect with the land unhindered by the company of others. Mid-April I landed in Kathmandu, immediately took a cab to the bus station where I boarded a bus headed towards Pokhara. There are many ways of travelling around Nepal; renting a car is usually illegal, which leaves flying the domestic airlines, local buses and renting a motorcycle. Having tried them all before, I highly recommend renting a Royal Enfield motorcycle as traffic is manageable and arrangements can be made with the renter to drop them off at different towns, at a cost of course. The local bus, however, has a charm of its own. Being tightly packed in a speeding bus as it rumbles along the mountain roads is more pleasant than it sounds, although travel durations set by the drivers are rather optimistic estimates. After registering at the trekking station in Pokhara, the start point Besi Shahar is just a three-hour car ride away. Upon arriving, I realize that it is quite an awkward place to being the Annapurna Circuit trek. This damp unassuming sleepy village bears no indication that it is indeed the start of a world famous trek, which you simply begin by walking down the little village road towards Bhulbhule – my planned stop for the first night. The first few days of the trek saw me walking through the mountain valley, following the river Marsyangdi upstream, through farm lands and tiny hill-top villages. At daybreak, the breeze carried the cold edge from the freshly melted mountain top snow, the scent of the seemingly endless rows of trees in the horizon, and my breakfast being cooked. Soon enough my mind got into the rhythm of the journey, each step forward and upward, slow but not always steady, unveiled stunning new horizons filled with flora and fauna, white peaks in the distance. I drew closer as my body slowly withered away. Under the sun, altitude is not always apparent and usually misleading. Come nightfall however, the vertical distance between yourself and the sea becomes largely apparent, as showering at the teahouses — which are usually equipped with solar heaters that only work in the day — is only left to those who can steel their hearts and freeze their limbs. At night no matter the season, the temperature plummets in villages after Chame, which resides at 2,710 metres above sea level. After dinner and intense contemplation about the prospects of death by shower — which usually ends with teeth brushing and wild assumptions about the cleaning properties of Himalayan air — the planning begins. To do this trek safely, alone, unassisted and unguided, a map, compass and a string would be recommended. Taking a couple of minutes each night to read the maps topography will help you decide on the distance feasible to be covered the following day, depending on the elevations to be expected. Underestimating the distance between two villages during the hairy moments that the sun is coming down could lead to a very frozen you in the middle of nowhere — always underestimate your walking pace, its helps from dying. 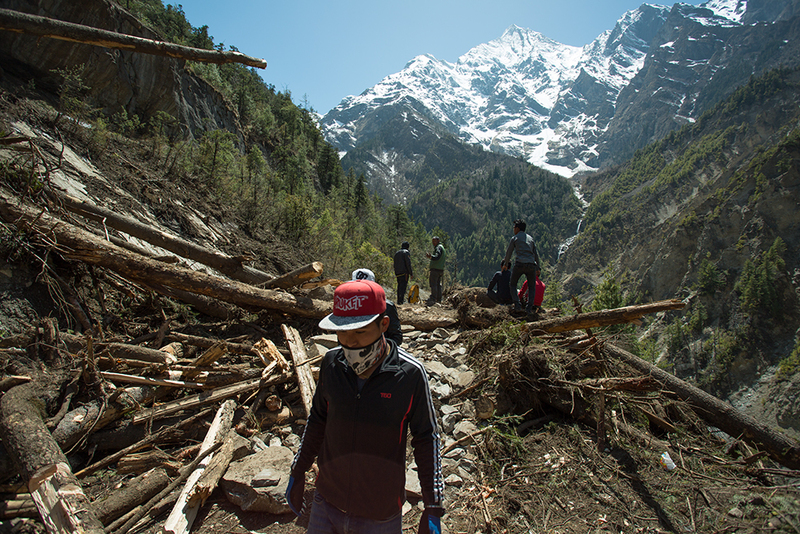 Annapurna Circuit is a popular trek, which does mean that you do encounter many people along the way. There were days however that I was the only thing moving in the picturesque landscape. I enjoyed the idea that there were people all around me, somewhere out there in the vast wilderness, exploring the world like I was. We were all alone, but together. After days of putting one foot in front of the other, without having said a thing to anyone for a couple days, and being completely responsible for your own fate really forces you to engage with your surroundings on a whole new level. I attempt to warrant my discussions to ensure that my safely is not overly compromised, while dealing with growing fatigue, the weight of my bag pounding on the shoulders as the sun cooks me ever so gently. Towards the end of my journey, I did amalgamate with a band of explorers. The morning always began with the provisional group in close proximity leaving the teahouse at an ungodly hour, progressively as the day goes by this distance increases, sometimes to kilometres. My goal was to end the trek at Manang, which is a large village comparatively to the ones encountered before. The narrow valley I had began this voyage on was beginning to widen rapidly. The river I had followed for the pass eight days, which was usually a stone’s throw from where I stood, was now too far to spot on the flat valley between the mountains. Manang broke the mountain valley with shapes and signs of civilization. Like a fairy tale kingdom, Manang has concrete walls and a ramp leading up to the town gate. One hundred ten kilometers after I had left Besi Shahar, I ended my trek and spent the next few days wandering around the valley at 3,560 metres above sea level. This was the best thing I had ever done with my life since. Blistered up feet, bruised shoulders and waist, sunburnt skin were all worth it. I am saddened by the idea of never being able to experience this for the first time ever again.